Chronic fatigue syndrome (CFS) is a debilitating illness that makes performing daily tasks of living difficult and at times, impossible. Like fibromyalgia, Chronic fatigue syndrome is one of a group of diseases considered "subjective conditions" because the diagnosis is not determined by specific test results. For long term disability insurance companies, seeing Chronic fatigue syndrome on a claim form immediately sends up a red flag. These claims present challenges for claimants because insurers often take the position that a condition must be supported by "objective evidence", something that with CFS is virtually impossible to provide. 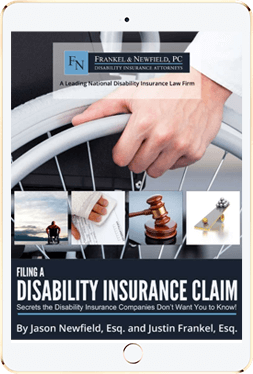 If you have been diagnosed as having CFS, it may be helpful to contact an experienced disability insurance claim law firm that has successfully represented CFS patients. The disability insurance process is a complex minefield that is not easily navigated, and claims concerning a subjective condition are even more challenging. If your primary care physician is not up to date with the diagnostic threshold set by the Center for Disease Control (CDC) that is used to diagnose CFS, your medical record may not support your disability claim properly. He or she may not know the importance of having your medical record outline, in very specific terms, the limitations and task constraints that this condition causes. Further complicating a disability claim for CFS is that patients often suffer from depression and anxiety, either as part of the disease or because of the disease and how it impacts their ability to enjoy a full and active life. Be careful not to allow yourself to be put in a mental and nervous claim category, as coverage for this group of claims is extremely limited, even in many of the best disability policies. Insurers will often seek to apply a limited pay period to claims for CFS if they in fact accept liability of the claim at all. This article examines the special challenges faced by CFIDS claimants when applying for Long Term Disability Insurance benefits. We have developed strong strategies to combat the challenges faced with Chronic Fatigue Syndrome claims. Working with professionals to develop objective evidence of functional deficits, both physical and cognitive, has helped lead to significant success for our client population. At Frankel & Newfield, we have a long record of successful representation of CFS patients at all phases of the claim process: before filing, during the process of being denied or delayed, in the appeals process, and in litigation. We understand the special challenges that CFS patients face in the disability claim insurance process. Call our offices today at 1-877-LTD-CLAIM (1-877-583-2524) to speak with a partner about your situation or, if you prefer, click here to send us an email.